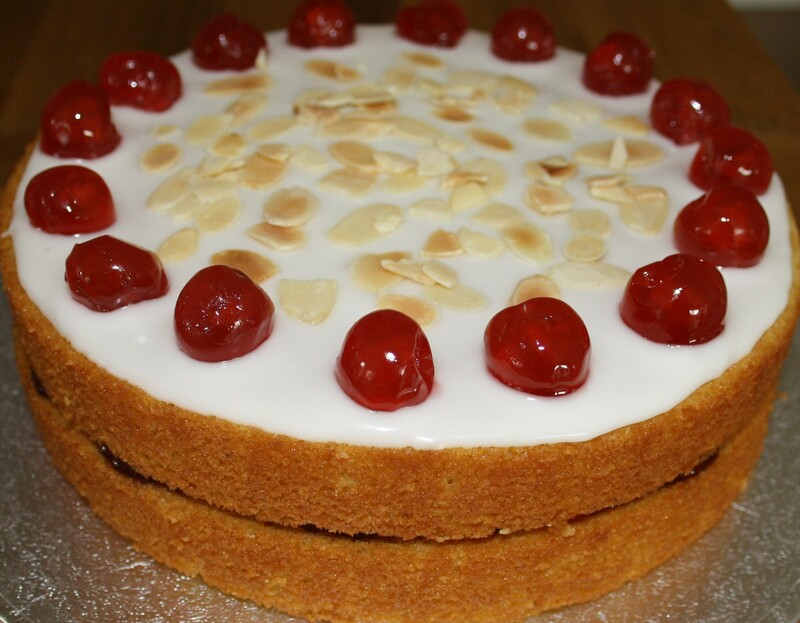 Cherry Bakewell Cake: A proper crowd pleaser! 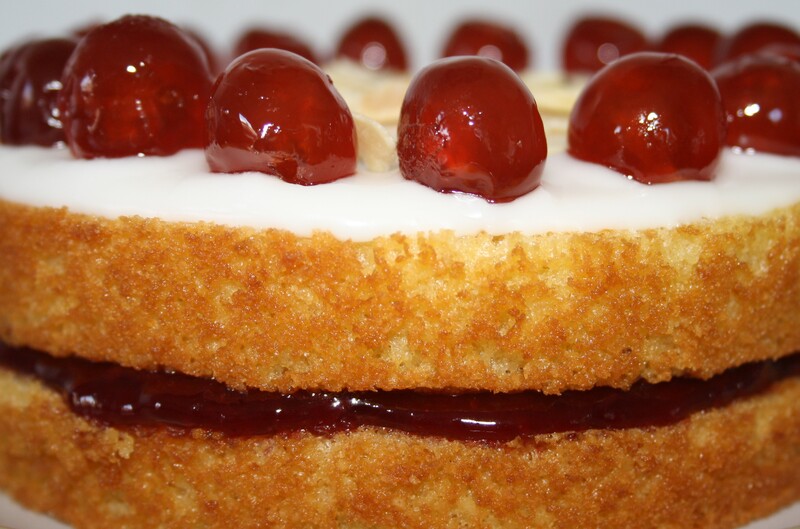 Cherry Bakewell Cake is a proper, all-round crowd pleaser. It always gets devoured within minutes, with lots of ooohs and ahhhs of appreciation. “Divine“, “I could eat the whole thing in one sitting“, “how many slices can I have?“, “that really is a very, very good cake” are among the comments this cake received on a recent outing. And the best, best thing of all – it’s dead simple to make! The ground almonds keep the cake lovely and moist for several days, if it ever hangs around that long. There is no butter or cream in the icing, making it a bit lighter than most cakes (room for seconds?!). Due to the flavour and texture of the almonds, this cake also works exceptionally well with dairy-free margarine, compared to other cakes. Or, you could make it gluten-free by replacing the relatively small amount of flour with a gf flour mix or more ground almonds. I like to put glistening glacé cherries and flaked almond on the top to showcase the bold flavours in the cake, and as a nod to the Bakewell Tart itself. It looks so attractive and homely…and very easily achieved. So, if you’re thinking of making a cake for a party, or perhaps to take into work, this is an excellent bet. It really is very tasty and a complete revelation to me (I don’t even like Bakewell Tarts!). Sit back and enjoy the rapture and delight you will cause if when you make this cake. Almond sponge, sandwiched with Bonne Maman Berries and Cherries Jam, topped with lemon glacé icing. Decorated with whole glacé cherries and flaked almonds. Recipe adapted from the extremely highly rated Good Food recipe by Jane Hornby – mine makes a thicker sponge. 1. Preheat the oven to 180 degrees / 160 degrees fan (or the temperature you use to bake cakes in your oven, each oven is different). 2. Prepare two 8 inch / 20 cm cake tins with a disc of greaseproof paper in the bottom. 3. Cream together the margarine and caster sugar until light and fluffy. 4. Add the lightly beaten eggs and sift the flour, baking powder and salt into the bowl. Add the ground almonds and almond essence. 5. Now beat everything together briefly until everything is just nicely incorporated. 6. Divide the cake batter between the two tins. Use the back of a spoon to make sure the batter is as level as possible. 7. Bake for about 30 minutes, until slightly golden and the cake springs back when lightly pressed in the middle. 8. Leave in the cake tin to cool for a couple of minutes, then remove and leave to cool on a baking rack. 9. Brush the cakes with Amaretto if you have some in the cupboard, but this is by no means essential to the deliciousness of the cake. 10. Put the bottom cake on the cake stand and dollop a very generous amount of jam onto it – about half a jar. 11. Make the glacé icing, by adding the liquid a few drops at a time to the SIFTED icing sugar, mixing all the time with a fork until it’s the right consistency. I keep it quite thick so it doesn’t run over the sides too much. If the lemon juice isn’t sufficient, add a few drops of water, but go steady! If it goes too runny, sift some more icing sugar into it. Some people like to add almond extract or Amaretto to the icing, but I personally find it too much – the lemon is a good balance to the almonds, in my opinion. 12. Pour the glacé icing onto the top of the cake and let it run to the edges. Depending on how thick / thin you have made it, you may need to help it out with a knife that’s been dipped in hot water. 13. Wait for the glacé icing to firm up a bit before you decorate it with the cherries and flaked almonds, otherwise you’ll lose them over the sides. Don’t wait too long though or the icing will form a crust! Looks yum, Ruth and ‘easy’ sounds good to me! This is a wonderful tasting cake. My tins are 23cm so I cranked up the proportions accordingly. I make this for my sister’s tea shop by the river and I cannot keep up with the demand. It goes down very well with her customers and it’s just a little different from what other T shops offer!